Want to send emails that get results? More opens. More clicks. More sales. and join the 35,000+ digital marketers who have already become email pros. 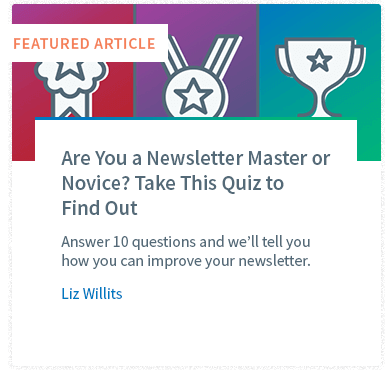 Get the Ultimate Guide to Email Marketing sent in your first email after you sign up for our newsletter! "It has helped me more than the MailChimp, GetResponse, and ConvertKit blogs." "The online world changes quickly...and often. How to navigate the sea of changes can be mystifying and nerve–racking. I've been an AWeber customer for over 10 years. You guys keep me current and provide the oars to guide my boat on the wide open sea of change." "I have always appreciated what you do for the small, medium, and large biz. [The newsletter] seems to cover all my needs." "I love the depth and breadth of topics it covers, in language anyone can understand!" "It teaches me answers to questions that I did not know I needed an answer, nor had thought to ask." Become an email marketing pro. Get this weekly newsletter sent to your inbox. When you subscribe, you’ll also get email updates from AWeber. We respect your email privacy.